It’s the first day of Spring and we are still in great shape despite last weeks warm temps and little bit of rain. The Poker Run and Rider Appreciation Weekend went off without a hitch, with right around 60 participants allowing us to raise $1537.50 for the Valley Riders Snowmobile Club. Special thanks to all those who participated and a huge thanks to all the contributing businesses. Yesterday we closed the doors and had our company day with staff, and found trails to be in good shape. Road crossings are definitely getting bare, and in about every clubs system, there is a 1 bare spot not associated with plowed roads which are also down to dirt in most places. It is really hard to nail down an accurate report but the best summary is there is varying conditions from trail to trail and day to day. Groomers have still been out and about at least 3 times a week, but traffic has been making an impact. In the mornings trails have been very had not softening until 1030am to 11am, which is when the bumps are getting formed. All and all the riding is still good, but if you are expecting perfect trails….well we will see you next season. The upcoming weather is showing so rain but also the potential for either 2″-4″ or 5″-8″ of snow depending on the report before it is all done. Warm temps on Sunday, then it should cool back down. So if you got to get another trail ride in this weekend is the time to do it, with good potential to get another ride in next weekend. From what we have heard, Northern Outdoors will continue to groom through 3.31.19 assuming conditions allow it, as well as Coburn Summit Riders. I have not heard from the Solon Snowhawks or Abanaki Snowriders, but I can tell you that Solon trails all and all are in good shape with 2′-3′ of snow still left in wooded sections. Our club should follow suit with the others, we will continue to groom at least twice a week if not 3 as long as conditions allow it. Stay safe, ride sober and stay on the right side of the trail! We received some disappointing news at the Valley Riders Snowmobile Club meeting here on Wed night 3.6.19 that our full time groomer Dr. Dave’s health concerns have forced him to give it up at the end of this season. We are in the process of training new operators this season to be prepared to try to fill the shoes of a great man. We shut the shop down on 3.7.19 and went for a ride on the trails to get a first hand view of conditions after receiving conflicting information from various riders at the shop. We traveled up ITS 87 which seemed to be in pretty good shape to the Dead Water rd, where we then followed the Palmer Pond rd which had not been groomed in several days but was in decent shape, minus some wind drifts that had the potential to be problematic, due to flat and fast conditions for miles between them. When we arrived at the Breakneck Ridge trail, we found it to be freshly groomed with only 2 tracks across it all the way to Monson. After lunch with Mike and Kim at Spring Creek BBQ, we filled up and headed to Greenville on ITS 85 north and found the rail bed to be in great shape minus the Shirley Bog wind drifts and one other closer to Greenville. From there we followed ITS 86 to the Forks and found it to be in pretty good shape as well will only a few bumps in the corners. We stopped into Northern Outdoors for gas and a warm up and found out the had freshly groomed ITS 87 south the night before which was in fantastic shape all the way to our system. From there, ITS 87 was also in really good shape all the way to the other side of the Austin Stream bridge minus the drifts on the Ripple road just after leaving the Chase Pond Rd. After we crossed the bridge, we noticed the groomer had gone up the Palmer Pond road we had been on in the morning, getting that knocked out as, as well as traveling into Tower 30 from that north end into the Wind Mills. Friday night (3.8.19) I found myself sitting next to Dr. Dave getting my first groomer operator lesson. We took off at 5:20pm went half way up ITS 84 east on Mahoney Hill and saved time by turning around at the closed opening of the Wind Mill travel as the trail proved to be in really good shape. So we go the connector to ITS 87 groomed and then the remainder of the railbed before refueling and heading up ITS 87 north to meet Northern Outdoors. ITS 87 north had its corners banked and a few rough spots but was all and all pretty decent. The responsibility of a groomer driver is no joke. My hat goes off to all that are involved for several reasons, most importantly taking on the responsibility of all that could go wrong. Saturday our club President Jack Lord went for a mid-morning ride to scout out our trail systems and abutting clubs to give Dr. Dave and idea of what was going to need be tended to the most. He found that by about 1130am ITS 87 was already in pretty rough shape due to all the traffic. So Dr. Dave returned to the trails Saturday night to groom both ITS systems. Yesterday around 4pm a few of us went out for a ride to mileage the Poker Run we have coming up this Saturday to raise funds for the club and found the following. ITS 87 south toward Solon had a few bumps but was in good shape. Solon’s trail system seem to have been freshly groomed Sat night and received less traffic then ours. This was the case on all their club trails as well. Once heading down into Athens corner store from the powerline ITS 84 section, it was quite bumpy but still had plenty of snow and just needed a fresh grooming. While traveling ITS 84 west back to our system meet at the end of Mahoney Hill rd we found to also have good coverage but was rough until hitting our system. In our system ITS 84 was in good shape but getting bumpy in spots all the way to the connector, and needed a touch up with the groomer. The connector trail held up great over the weekend and made a nice short cut to the Bingham General store. Where to connector comes in on ITS 87, south was in good shape to the powerline and down into Moscow and the Austin Stream wire bridge crossing behind Lavallee’s Garage. Once crossing the bridge to the right had been freshly groomed, but heading into Bingham General store was pretty bumpy and needed a pipe drag brought through it a few times to get it smoothed out. This week the temp is warming up with light rain forecasted for Friday and a couple of passing showers on Saturday, with temps then dropping back to the teens Saturday night and all next week. If we can get folks to hold off this weekend, groomers will have plenty to work with Saturday night and prolong next weeks riding to have good to great conditions for late season riding. Bare in mind that plowed roads, and road crossings are going to start becoming a pain, and the snow will start to begin to be eaten away from underneath the trail. This may cause holes in the trail and ice to open up mean drivers will need to operate with even more caution than normal. But don’t get me wrong, there is still a ton of snow and an immaculate base and I am anticipating riding into April at this point! As always, ride right, ride sober and ride safe! Well after a busy vacation week with lots of traffic, and fresh snow the trails are in fantastic shape. We have received over another foot of snow since our last report and even with all the traffic riders reported good to excellent conditions daily. You can quite literally ride out of Bingham north, south, east or west and return from a completely different direction. The one recent downside unfortunately is that the Wind Mill trail has been shut down on our southern end due to a logging operation. If entering from the Palmer Pond rd end coming from the Dead Water rd, Breakneck Ridge trail, or Bald Mtn trail, you can go up to tower 30 and do the loop around them, head towards Abbott (but not sure what grooming conditions are like) or dead end yourself at the Rt 16 crossing just before the Wind Mill office building. So if traveling from the Forks and looking to do that loop, just realize that you either need to take a left off the Austin Stream bridge on to the Dead Water rd. Within 100′ on the plowed Dead Water rd you will notice the groomed section on the Palmer Pond rd. This take you about 6 or 7mi before you can head in to the Wind Mills. It is about 5-6mi to the Wind Towers which you will have to back track and then continue up the Palmer Pond Rd, past the Breakneck Ridge intersection and back on the Bald Mtn trail. Do be careful…we had significant winds this week that have created drifts in different places that can cause issue. In our system the most common is when traveling past Austin Pond between the Breakneck Ridge and Bald Mtn trails. A potential positive we were made aware of this week was a new club attempting to get formed for the coming year or next in Kingsbury. They are hopeful to meet all abutting clubs and work together to better connect our systems! Is groomed in good shape and has good coverage. Groomed all the way to Skowhegan and has been in great shape with limited traffic the last few days! Is groomed and in great shape all the way to the power line section where you would meet the Solon and Athens clubs. Also groomed to the Solon Dam from our club is in great shape. We have been told it is excellent riding all the way over to Kingfield and beyond. From ITS 84 taking a left on what some call the Sunshine trail and others the old upper Lake Rd that was closed for most of ATV season, was open and groomed but is now closed due to a logging operation. This is now closed again due to a new logging operation. The northern end just before Dead Water rd is still open access for ITS 87 across the Austin Stream bridge or continue to the Palmer Pond rd taking you to the Breakneck Ridge and Bald Mtn trails. This trail is open but not groomed by our club. 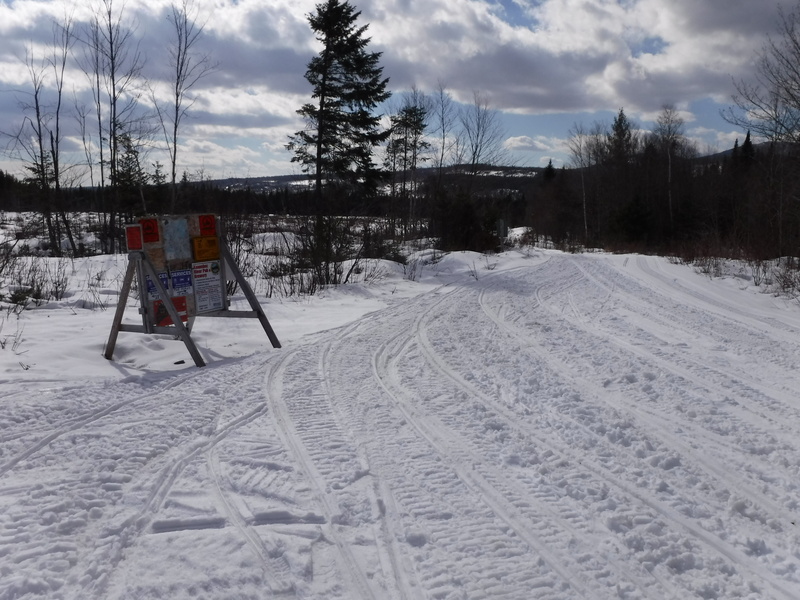 The first part of it has been groomed to the Stagecoach rd but has not beyond that connecting the Wind Mill trail which is now closed for the season anyway, so riders should not continue past the Stagecoach Rd that takes you into Brighton. Groomed with access to Kingfield and Stratton. If looking to get to Carrabassett Valley, trail signage will indicate heading toward Kingfield as the assumed shorter route. Just realize the old trail that went straight to Carrabassett Valley past Happy Horseshoe has been re-routed towards Kingfield. Well we have been quite busy since our last report but have done a little riding and we have received some fresh snow just in time for vacation week of 12″-15″ after a warm up and some light rain. As of Friday night the trails had not been groomed due to warmer temps and light rain that evening, making Saturday not so pleasant come the end of the day. Since then ITS 84 and ITS 87 were groomed on Saturday evening and are in good shape. As of last night, the rest of the system should have been groomed to include the Wind Towers and lower Palmer Pond road connecting from the Austin Stream bridge off Dead Water road to the Wind Farm, Breakneck Ridge and Bald Mtn trail system. Lavallee’s Garage = $250, Valley Auto Parts = $250, 201 PowerSports = $500, Bingham General Store = $500, Jimmy’s Market = $500, North Country Rivers = $500 and Crestview Kennels of Bedford, MA = $100. We are hoping more to come in soon, but we can use all the help we can get to get back to the 5 days schedule! From ITS 84 taking a left on what some call the Sunshine trail and others the old upper Lake Rd that was closed for most of ATV season, is open groomed and in great shape all the way to the Palmer Pond Rd intersection, and continues to where we meet Northern Outdoors just past Austin Lake as well as back to ITS 87 at the Austin Stream bridge. Bald Mtn trail is now open and being groomed regularly. Breakneck Ridge was in excellent shape this past Saturday on our guided trip, and offered some old school pip drag loops that no one had been on. We have now got this back for the rest of the season. If coming from ITS 84 over to ITS 87 you will come to the road and take a left down the edge of the road to access the Town Line rd that is being plowed all the way to Dead Water rd. Please be sure to take the left off Town Line rd about a mile down so that you intersect ITS 87 where you are supposed to and not run the plowed road all the way to Dead Water. This trail is open but not groomed by our club. With the right conditions it can be a rocket ship ride with sections over a mile straight as an arrow. The first part of it has been groomed to the Stagecoach rd but has not beyond that connecting the Wind Mill trail as work projects still exist on that side. We have been being told these trails have been being maintained regularly as of late and are in great shape with limited traffic. We made it through the rain storm!!! Our groomer after grooming Monday and Tuesday night after the snow storm, got back on the trails the past 3 nights. Friday and Saturday night were spent on ITS 87 as it needed it again Saturday night after all the traffic. The Wind Farm, ITS 84 and Palmer Pond road were still in good shape from Tuesday nights grooming so they were left alone until last night. Now our entire system has been freshened up and is in great shape. There are no bare spots and plenty of lubrication for the slides and heat exchangers. We took a ride yesterday from town up ITS 87 north, went by the Austin Stream Bridge and turned on the Palmer Pond rd. ITS 87 at 12pm had good coverage and was in good shape even with the traffic. The texture of the snow was much like sugar until we got on the Palmer Pond rd. From there all the way to Austin Pond and the Breakneck Ridge trail was firm, flat and hardly traveled at all. We went down the Breakneck Ridge trail a ways but not all the way to the Blanchard intersection that takes you into Monson, because it was in great shape per usual land all I needed to know. There was one spot in the trail that had a small amount of damage from the rain that was marked of with upright brush, so riders should be aware that some areas may have a spot or 2 to keep an eye when coming around corners. From there we retreated back to the Wind Mill trail and came back to ITS 84, hit the rail bed ITS 87 north and back to the shop. Once off Palmer Pond rd heading through the Wind Mill trail, we found conditions to be a perfect mix, not to firm and not sugar like ITS 87. Just before tower 32 intersection there was a small hole in the trail, I am assuming the groomer was able to cover up last night, and the top of the bluff at tower 30 lookout was completely covered in ice, with a little snow on the sides here and there for about 200′ but had no bare gravel showing. This means the next snow storm will make the top very slippery until it sets up and freezes back to the ice. We also did a little off trail playing near the towers and Breakneck Ridge trail system and found an average of 3′-4′ and spots with 6′-7′!!! Groomed in great shape and good coverage all the way to the start of the Forks trail section, which we here is also and has been in great shape. We are still sharing the Chase Pond rd with Weyerhauser to the Cow Mountain rd where we take a left. At this point you will find groomed, covered trail all the way to the forks with the exception of the driveway at Pleasant Pond that is plowed every year. The only two club connectors that are both open and groomed are the one 5 miles out of town that will take you back to the top of Mahoney Hill (ITS 84) where you can head towards Athens on the power line or back to the rail bed to access the north end of Solon or the south end of Bingham as an alternative to ITS 87 all the way through Bingham, and the other being the Palmer Pond rd used for ATV season, and ITS 87 2 or 3 years ago just beyond the Austin Stream bridge on the right. The Palmer Pond rd allows the quickest route to the Breakneck Ridge trail head, and allows a nice 3-4hr loop through the Wind Farm now that it is open. Groomed all the way to Skowhegan. Spots in Madison and Skowhegan sections may have some frozen and water damaged areas. Also groomed to the Solon Dam from our club is in great shape. Carrabassett River crossing was clsoed as of 1.24.19 due to the recent rain storm. I anticipate they will reopen it this weekend after the cold stretch later in the week. From ITS 84 taking a left on what some call the Sunshine trail and others the old upper Lake Rd that was closed for most of ATV season, is open groomed and in great shape all the way to the Palmer Pond Rd intersection, and continues to where we meet Northern Outdoors just past Austin Lake. 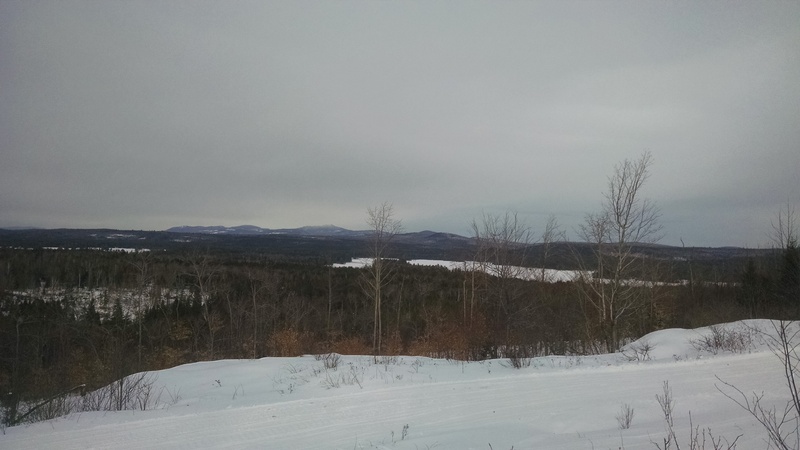 After reading Northern Outdoors trail report at the end of last week, the Bald Mtn trail is on there list to get groomed for the first run of the season this week. The trail is open, but has yet to be maintained due to a logging operation that just finished up. If taking the Breakneck Ridge trail over to Monson, Blanchard, Shirley or a short cut to Greenville in great shape! Do be mindful about 5mi in there is a marked out and frozen back up small water hole after coming around a left hand corner. Closed for the season due to a logging operation. Please respect the Land Owners wishes and stay off the plowed roads here to avoid possible future closure. A potential rumor currently is that we may have that back before the end of the season, but just a rumor at this point NOT fact. Trails have been groomed from the Concord end, and we were told that Lexington had headed our way at the end of last week. We are told the trails are in good shape and have had a limited amount of traffic. We had also heard that there was a trail closure issue at the Happy Horseshoe Campground intersection preventing folks from entering Kingfield and Carrabassett Valley, but taking a right and heading to the back of the Bigelow preserve and Flagstaff lake were groomed and in good shape allowing for a nice loop to Grand Falls and back through the Forks. As always, stay safe. Never ride alone, leave a plan at home, ride right and we will hope to see you out there!!! Well its been a while since our last report, and we have received 2 major storms since then. The first storm brought on 1.9.19 about a foot of heavy wet snow that stuck to the trees after a light misting through the night that caused clubs to be out in full force to reopen and groom trails. This storm put us into amazing riding conditions for that weekend if you were in the right places, and only improved throughout the week. Most clubs spent 5-7 days clearing brush and re-grooming. This allowed our clubs to the south as far as Skowhegan to groom and open their trail systems with decent to good conditions. Riders reported excellent conditions for ITS 84 toward Kingfield on Monday 1.14.19 as well as ITS 87 to the Forks on Tuesday 1.15.19. After a staff ride for dinner to the Inn by the River in the Forks Thursday night 1.17.19 we were able to verify that if you haven’t been up here riding yet you need to be. Then this past Sunday 1.20.19 we received and additional 14″-18″ of fresh fluffy snow that did blow around the last couple of days creating drifts in some areas, but also added to our amazing base. As of this morning it appears that all clubs have been out and got their systems groomed the last 2 nights including our clubs to the south as far as Skowhegan, in preparation for our next storm this evening through Thursday evening. Not to be misunderstood, we are suppose to be receiving a wintery mix this evening late, that will turn to rain tomorrow with temps in the 40’s. It appears for no that there will be no down pours, just a light steady/consistent rain for a 12hr period, then the temperature plummeting freezing everything up rock solid until the groomers get out Friday night and break things up which should help with lubrication. We are in no way fearful that the trails will be damaged, but rather help put some moisture back in the snow allowing groomers to do their thing. We are however URGING folks to stay off the trails on Thursday and Thursday night to avoid causing unnecessary damage to the trails. No Friday riding is not going to be that great because groomers will have to wait until Friday night before they can start to do their work. No one likes to wait 2 days to ride when they have planned their trip, but it is in everyone’s best interest to hold out. Groomed all the way to the Solon Dam and as far south as Griswold’s Country Store in Solon. From there for possibly another week, the trail dead ends due to a logging operation on the McCarthy rd just south of Griswold’s store. The detour needed to continue south on ITS 87 to access the southern most portion of the Solon club system, to Madison and Skowhegan, starts on ITS 84 from the Bingham/Solon rail bed. From there you must follow ITS 84 to the end of Mahoney Hill where you will get on the power line and follow it past Solon’s Club trail 22/23 all the way until you run into ITS 113 which will be on your right, a plowed driveway, as ITS 84 breaks off to the left into Athens. The plowed driveway you travel about 150 feet before turning left into the woods. At this point you will follow ITS 113 all the way back to ITS 87. Before getting back to ITS 87 you will pass a club trail intersection I believe is either 21 or 22. Short version, ITS 84 east to ITS 113 south, to ITS 87 south. Also groomed to the Solon Dam from our club is in great shape. Since the most recent storm on Sunday not sure if the Anson club has made it up through, but I imagine they have, and certainly will Friday night. Conditions are said to be great all the way to Kingfield, and the Carrabassett River crossing was opened up as of 1.12.19 and is said to be now safe to cross. From ITS 84 taking a left on what some call the Sunshine trail and others the old upper Lake Rd that was closed for most of ATV season, is open groomed and in great shape all the way to the Palmer Pond Rd intersection, and continues to where we meet Northern Outdoors just past Austin Lake. We have heard rumor that Northern is attempting to get the Bald Mtn trail opened for the weekend, as groomer issues have prevented it thus far as well as a logging operation just finishing up last weekend. If taking the Breakneck Ridge trail over to Monson, Blanchard, Shirley or a short cut to Greenville, you should find great to fantastic conditions, as thr Four Winds club to our knowledge has been out in full force with no current issues keeping their trails maintained and in great shape! Closed for the season due to a logging operation. Please respect the Land Owners wishes and stay off the plowed roads here to avoid possible future closure. This trail is open but not groomed by our club. With the right conditions it can be a rocket ship ride with sections over a mile straight as an arrow. Occasionally we see the Brighton area come through with a groomer off the Stagecoach Rd, but have heard rumors that the Brighton, Wellington, Harmony area have been lacking on trail maintenance this season. If they have made it through, (there was a bridge out during ATV season on the Stagecoach rd that may be preventing it) you will still find the first mile from ITS 84 to the Stagecoach rd bumpy. The Iron Gate rd is the club connector from ITS 84 to the start of the Wind Mill trail, and the closed Townline rd section. Unfortunately this awesome, and limited use section of trail has had little to no maintenance done to it this season. This is not by our eyes, but those of other riders and land owners reporting conditions and asking questions. If you have ever ridden this area, and enjoy the ability to get to Carrabassett Valley so quickly with great conditions, limited traffic and spectacular views, get involved with their club as the are in desperate need of help, down to just 2 or 3 active volunteers on the trails the last several years. Trails are all groomed and ready to be ridden! I will hopefully have a more detailed report tomorrow if I can get out there tonight or first thing in the morning! Following last weeks rain storm we have received 3 snow storms. Last Saturday 12/29 we received about 4″ of fresh fluffy snow that was capped off with some rain holding it in place for the high winds we received after it and provided the base that remained from the rain storm with some ride able snow. 1/1 we received actually more than up north in Jackman with 7″ of heavy we snow, and a very light mist after it. This allowed groomers to get on the trails the last 2 nights to smooth out their systems and get them all re-opened. Clubs are reporting that all running water has froze back up, and cracks created as well as other trail problems have been for the most part filled in. Northern Outdoors as of yesterday and Breakneck Ridge trail as of the day before have connected with our system and are reporting good conditions. We do have some closures and re-routes in affect. Pleasant Pond Club Trail that links the Bald Mtn trail will be closed due to logging, and the Bald Mtn trail connecting ITS 86 to the Bingham trail system by Lake Austin will be closed for a few more weeks until another logging operation is complete. So for now the only loop to the Forks is ITS 87 to ITS 86 to Greenville then ITS 85 south to the Breakneck Ridge trail which is a very large loop for most but doable for many as well. ITS 87 North toward the forks you will find a shared section of road that Weyerhauser is allowing us the PRIVILEGE to use. Please follow the 15MPH signs, use caution, and give them plenty of room to work. Our understanding is that this section will be logged all winter and there is no other re-route for ITS 87 if we loose it. The south end of the Palmer Pond road by the Austin Stream bridge is also being plowed as of now and is closed for that reason until they are finished logging. The Forks area map is in the printing process now and should be available in the coming days will show that it connects, because we are anticipating to have it before the end of the season, possibly the end of January. As always, ride right, ride safe and we will see you on the trails. Mother Nature has blessed us with another 16″ of heavy wet snow, with more in localized places. Groomers from Skowhegan all the way up through were out in full force last night laying down the fresh snow. ITS 87 and ITS 84 were groomed as of last night as well as all connector trails. We are anticipating the Wind Farm trail to be groomed this evening. ITS 87 had been groomed and new signage put up for the ITS 87 detour for the remainder of the season. If traveling north on ITS 87, once coming off the Mccarthy Rd and traveling through the section of standing pine trees, you will be detoured to the side of 201 north to Griswold’s as the land owner behind the store has closed that connection to the Solon Superette indefinitely! Please stay on an follow the designated trail down the edge of 201 to Griswold’s, where you cross the road and follow the new trail through the Evergreen’s Campground. When you come to the road, you will turn left and travel across the Solon bridge. Once on the other side you will veer slightly to the right, and travel up the driveway until you run into the ITS 84 intersection which is only about 100′ from the start of the driveway off Rt 201A. From there you will want to take a right to continue on ITS 87 north where you will cross the Solon Dam and then be back in familiar territory and the original ITS 87, where the Valley Riders Club starts their maintenance. You can still access the Solon Superette from this side for fuel. ITS 87 has been groomed to its Skowhegan Sno-Hawks border at Ken’s Family Restaurant. Club trails are reported to be being groomed this evening. The snow is very soft and warmer temps through Friday will keep them soft. Friday night it appears the temperature will fall out for the next several nights allowing trails to set up nice and firm before next weeks storm. Some are forecasting the potential for another substantial storm, but as of now is looking 1-3″ for 3 days in a row! Hope to see you out there til April! That being said now is a great time to get some riding in. It appeared that last weekend was the big push for one last ride, and the general consensus among the riding community is that they are ready for spring. This will mean less traffic and better trail conditions for those willing to ride the winter out. Ride right and be safe! Well mother nature has surprised us again. After last weekend the consensuses was becoming that it was still ride able but getting time to call it quits. Yesterday and through last night we received somewhere in the neighborhood of 14″-16″ inches of fresh heavy wet snow. After a day of snow removal including clearing our the park and ride next door, Dr Dave headed out in the groomer. All trails last night were groomed with the exception of the Wind Farm trail which will being accomplished this evening. ITS 87 north out of town is in much better shape but is still thin and somewhat rough according to Dave as we had pretty much lost it before the storm. That being said the best way in and out of town is still by accessing ITS 84 from the railbed just south of us 3mi. Once at the Wind Farm intersection either option should be great through the weekend, whether traveling north via the Wind Farm trail, or crossing over Rt 16 to the Town Line Rd and run ITS 87 north from 8mi outside of town. The snow is very soft due to warm temperatures and folks have already been sliding off the trails. Use caution and have a safe ride! Make sure to stop in and see us this weekend for our st Annual Rider Appreciation Weekend! We will be raffling off the following items for $1 per ticket or 6 tickets for $5! We will also be auctioning off a Medium red Keweenaw Parka a $439.99 value, proceeds to benefit the Valley Riders Snowmobile Club as well as Bake Sale and 50/50 raffle! Sunday afternoon at 3pm we will do a live Facebook feed to announce the winners, and allow live bids on the Klim Coat auction. Silent bids may be made on Saturday and updated during the live auction! We want to thank all other business member and community members who have helped make this possible with cash donations towards snacks and supplies, food from Jimmy’s Market, baked goods and your time! Went for a ride today from the shop north up ITS 87 and found thin trails and several bare spots though the groomer had been through. Once turning right 8mi outside of town and heading back to Rt 16 and the start of the Wind Farm trail I found great coverage and conditions. This continued on the top of the Wind Farm thanks to last nights 4″ snow storm, but today and the next 2 days of 40˚F weather has me concerned for trails beyond this upcoming weekend for our rider appreciation weekend. From the top of the Wind Farm past Austin Pond and into the Northern Outdoors trail system the trails were in fantastic shape though conditions are thinning. I took the Bald Mtn trail which was in great shape to the gate 3mi before the Shirley Tote Rd where the old Breakneck Ridge connector use to go through 3 or 4 years ago. Decided to take a trip down memory lane and found lots of snow on the old connector. This stretch had not been groomed all year but was in pretty good shape and had 2′ plus of snow. Once getting over to the Blanchard club area that had been being pipe dragged this season from the CC trail area back to the Breakneck Ridge trail I found thinner conditions but the trails were flat a covered nicely all the way back to the Wind Farm trail. On my way back from the Wind Farm trail I took the Sunshine trail connector that links back to ITS 84 on the Mahoney Hill Rd at the major intersection, then a right on ITS 84 west and followed it all the way to the ITS 87 rail bed and back to the shop. This was certainly the best way in and out of town. I have a feeling trails will be a little icy this weekend, so use extra caution in the corners. Hope to see you March 10th and 11th for our 1st Annual Rider Appreciation Weekend!